Ivan and Francesca booked me to shoot their wedding day at the gorgeous Chateau d'Oron in Vaud, Switzerland. They were having a partly destination wedding with Francesca travelling from Italy on the day of the wedding so the first time we met was at the castle. I usually recommend a pre-wedding shoot to help my couples feel at ease in front of the camera but both Ivan and Francesca were so full of joy that they were a pleasure to work with. They were keen to capture their friends and family as well as the general atmosphere of the day and the place. We took a short half an hour away from cocktail hour to capture some unique wedding couple shots around the castle and I made sure to try to capture the energy of these two when the party started in the castle cellars. As well as hi-res files to print at home, Ivan and Francesca wanted a special wedding album that also captured all the details of their day. Knowing this in advance helped me to make sure I had time to photograph the room and other little details to better tell the story of their day. When you make the big decisions in life it's important to remember who you are. Don't get caught up in passing trends or living your life as if it were somehow better because of its similarity to another. Embracing what's in your soul lets out a light that can spread to everyone around you. Courtesy of Francesa and Ivan I was lucky enough to share in that special joyous. 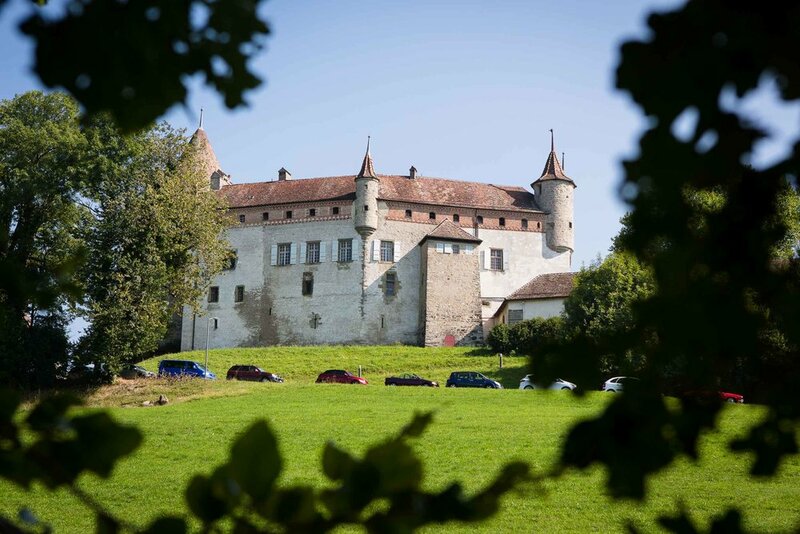 They married in the stunning Château d’Oron, on the border of Vaud and Fribourg. From the moment I first met the best man, I knew that this was going to be a wedding of true individuals, and Francesca in her beautiful gown covered in red roses, did not disappoint. She grooved down the aisle with her bridesmaid, only just upstaging the groom and best man. The ceremony was filled with emotion and Francesca’s reaction to the exchange of vows is one of my absolute favourites. She wore her heart on her sleeve and had us all in tears. After family groups and some drinks in the castle courtyard, we wandered around the castle chatting and capturing some memorable photos of the two of them as newly weds. I especially loved how Ivan’s socks matched Francesca’s dress. We started the wedding pictures as everyone was arriving at the castle, making time for some groom portraits before ushering him inside to wait for the bride. The couple brought touches of modernity and their personality to the castle setting which made for a really unique ambiance and lots of great photo opportunities. Ivan and Francesca wanted a unique wedding album and thank you cards to send out to people who weren’t able to make the journey. I created a couple of designs to reflect their style and they chose an illustrated wedding album design with a beautiful silk cover that matched Francesca’s dress perfectly. As well as my wedding collection which includes everything you need to make the most from your wedding day photography, I also offer bespoke à la carte pricing. This allows my clients to choose the coverage they need and the products they want depending on what works best for their wedding day. With all the costs available in advance there are no surprises afterwards and I am always happy to find alternatives if there is something specific you have in mind. To find out more about my wedding photography in Switzerland, please get in touch to book a chat or receive a brochure.